(CAMBRIDGE, Mass. )–Human skin must flex and stretch to accommodate the body's every move. Anything worn tight on the body must also be able to flex around muscles and joints, which helps explain why synthetic fabrics like spandex are popular in active wear. 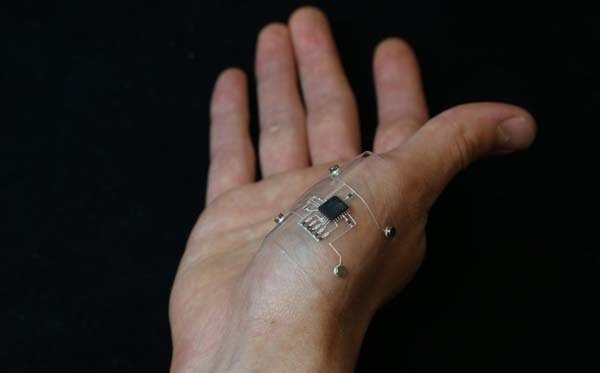 Wearable electronic devices that aim to track and measure the body's movements must possess similar properties, yet integrating rigid electrical components on or within skin-mimicking matrix materials has proven to be challenging. Such components cannot stretch and dissipate forces like soft materials can, and this mismatch in flexibility concentrates stress at the junction between the hard and soft elements, frequently causing wearable devices to fail. Now, a collaboration between the lab of Jennifer Lewis, Sc.D. at the Wyss Institute for Biologically Inspired Engineering at Harvard University and the Harvard John A. Paulson School of Engineering and Applied Sciences (SEAS), and J. Daniel Berrigan, Ph.D., and Michael Durstock, Ph.D., at the U.S. Air Force Research Laboratory (AFRL) has created a new additive manufacturing technique for soft electronics, called hybrid 3D printing, that integrates soft, electrically conductive inks and matrix materials with rigid electronic components into a single, stretchable device. "By combining the physical precision of 3D printing with the digital programmability of electronic components, we are literally building the future." "With this technique, we can print the electronic sensor directly onto the material, digitally pick-and-place electronic components, and print the conductive interconnects that complete the electronic circuitry required to 'read' the sensor's data signal in one fell swoop," said first author Alex Valentine, who was a staff engineer at the Wyss Institute when the study was completed and is currently a medical student at the Boston University School of Medicine. The study is published in Advanced Materials. "Because both the substrate and the electrodes contain TPU, when they are co-printed layer-by-layer, they strongly adhere to one another prior to drying," explained Valentine. "After the solvent evaporates, both of the inks solidify, forming an integrated system that is both flexible and stretchable." Because the ink and substrate are 3D-printed, we have complete control over where the conductive features are patterned, and can design circuits to create soft electronic devices of nearly every size and shape," said Will Boley, Ph.D., a postdoctoral researcher in the Lewis lab at SEAS and co-author of the paper. "We believe that this is an important first step toward making customizable, wearable electronics that are lower-cost and mechanically robust." Soft sensors composed of conductive materials that exhibit changes in their electrical conductivity when stretched (which is how they detect movement) are coupled with a programmable microcontroller chip to process those data, as well as a readout device that communicates the data in a form that humans can understand. To achieve this, the researchers combined the printed soft sensors with a digital pick-and-place process that applies a modest vacuum through an empty printing nozzle (through which ink is normally dispensed) to pick up electronic components and place them onto the substrate surface in a specific, programmable manner. As a simple proof-of-concept, the team created two soft electronic devices to demonstrate the full capabilities of this additive manufacturing technique. 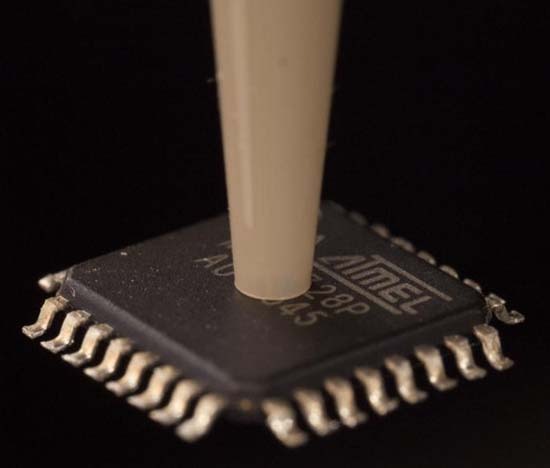 A strain sensor was fabricated by printing TPU and silver-TPU-ink electrodes onto a textile base and applying a microcontroller chip and readout LEDs via the pick-and-place method. 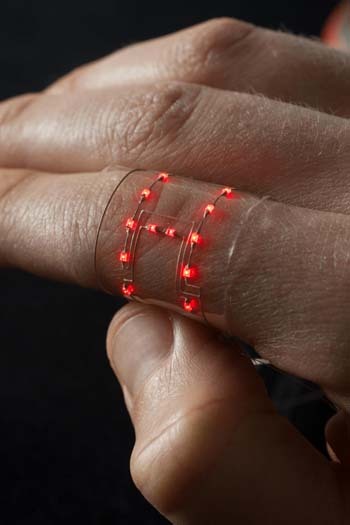 This resulted in a wearable sleeve-like device that indicates how much the wearer's arm is bending through successive lighting-up of the LEDs. The second device, a pressure sensor in the shape of a person's left footprint, was created by printing alternating layers of conductive silver-TPU electrodes and insulating TPU to form electrical capacitors on a soft TPU substrate, the deformation patterns of which are processed by a manual electrical readout system to make a visual "heat map" image of the foot when a person steps on the sensor. "We have both broadened the palette of printable electronic materials and expanded our programmable, multi-material printing platform to enable digital 'pick-and-place' of electronic components. We believe that this is an important first step toward making customizable, wearable electronics that are lower-cost and mechanically robust," said Lewis, who is the corresponding author of the paper, a Core Faculty member at the Wyss Institute, and the Hansjörg Wyss Professor of Biologically Inspired Engineering at SEAS. "This new method is a great example of the type of cross-disciplinary collaborative work that distinguishes the Wyss Institute from many other research labs," said Wyss Founding Director Don Ingber, M.D., Ph.D., who is also the Judah Folkman Professor of Vascular Biology at Harvard Medical School and the Vascular Biology Program at Boston Children's Hospital, as well as a professor of bioengineering at Harvard SEAS. "By combining the physical precision of 3D printing with the digital programmability of electronic components, we are literally building the future." Additional authors of the study include Travis Busbee, a graduate student in the Lewis lab and co-founder of Voxel8 (www.voxel8.com); Jordan Raney, Ph.D., former postdoc in the Lewis lab and current assistant professor in the School of Engineering and Applied Sciences at the University of Pennsylvania; Alex Chortos, Ph.D., and a postdoc in the Lewis lab; and Arda Kotikian, a graduate research fellow in the Lewis lab. The Wyss Institute for Biologically Inspired Engineering at Harvard University (http://wyss.harvard.edu) uses Nature's design principles to develop bioinspired materials and devices that will transform medicine and create a more sustainable world. Wyss researchers are developing innovative new engineering solutions for healthcare, energy, architecture, robotics, and manufacturing that are translated into commercial products and therapies through collaborations with clinical investigators, corporate alliances, and formation of new startups. A new hybrid 3D printing technique developed at the Wyss Institute at Harvard University, Harvard's John A. Paulson School of Engineering and Applied Sciences, and the Air Force Research Laboratory combines stretchable conductive inks and electronic components into flexible, durable wearable devices that move with the body and offer increased programmability. The Wyss Institute creates transformative technological breakthroughs by engaging in high risk research, and crosses disciplinary and institutional barriers, working as an alliance that includes Harvard's Schools of Medicine, Engineering, Arts & Sciences and Design, and in partnership with Beth Israel Deaconess Medical Center, Brigham and Women's Hospital, Boston Children's Hospital, Dana–Farber Cancer Institute, Massachusetts General Hospital, the University of Massachusetts Medical School, Spaulding Rehabilitation Hospital, Boston University, Tufts University, Charité – Universitätsmedizin Berlin, University of Zurich and Massachusetts Institute of Technology. The Harvard John A. Paulson School of Engineering and Applied Sciences (http://seas.harvard.edu) serves as the connector and integrator of Harvard's teaching and research efforts in engineering, applied sciences, and technology. Through collaboration with researchers from all parts of Harvard, other universities, and corporate and foundational partners, the school brings discovery and innovation directly to bear on improving human life and society. The Air Force Research Laboratory (http://www.wpafb.af.mil/afrl/) is a global technical enterprise that unleashes the power of scientific and technical innovation. Its mission is leading the discovery, development, and integration of affordable warfighting technologies for the nation's air, space, and cyberspace force.